You are here: Home / Campaign Tips / Facebook Ads Do Not Work! Facebook Ads Do Not Work! I used to think that Facebook Ads do not work, but was wrong (it happens from time to time)! I’ll certainly say from personal experience that Facebook Ads can be quite challenging for certain verticals. However, after reading Jonathan Volk’s Facebook Ads Guide, I’m convinced that there’s serious money to be made in Facebook advertising and am personally empowered with some new ideas that are going to make Facebook advertising work for me. Today, I’m going to review Jonathan Volk’s Facebook Ads Guide and my key takeaways. If you leave with only one message, I sincerely urge you to purchase your copy of Jonathan Volk’s Facebook Ads Guide. It’s only $79 (limited time discount) and you owe it to your career in search engine marketing! If you’re in the corporate world of SEM (like me), you may even be able to expense this charge to your company (every company should own this guide in my opinion)! Who Is Jonathan Volk and Why Do I Trust This Guy? I’m going to start out with a brief introduction of my friend Jonathan Volk. Jonathan Volk is another San Francisco Bay Area marketer who has generated $3,693.21 per day for over 10 months in his personal Facebook advertising account! Aside from Facebook, Jonathan runs one of the most successful blogs on the Internet about how to make money online. I was actually honored a while back when Jonathan personally interviewed yours truly on his blog. Put simply, Jonathan is a force to be reckoned with in the world of online marketing and is the go to guy when it comes to Facebook Ads. I recently presented online marketing tips to Stanford’s Graduate School of Business. The presentation couldn’t have gone any better! During the presentation, I remember getting questions from GSB students about Facebook Ads. I also remember telling them that Facebook doesn’t work! If there’s only one part of the presentation that I’d like to change, it would be my response on Facebook Ads. At the time, I think it was super advice. Now that Jonathan’s guide exists, I’d like to reframe my answer: "Facebook Ads don’t work… Unless you first read Jonathan Volk’s guide!" Facebook Ads are challenging because the strategies and tactics are quite different than the tried and true Google AdWords, Yahoo Search Marketing, and Microsoft adCenter ones. In fact, some of the winning strategies directly conflict with what you’d do on the major search engines! Heck, Facebook even had Jonathan Volk stumped for a while. However, he devoted himself to making it work. After investing substantial time and money in testing, Jonathan finally cracked the code. I’m now convinced that Facebook Ads work and personally walked away from Jonathan’s guide with a wealth of actionable tips. More than anything, I’m excited to know that I can benefit from Jonathan’s investment and not have to invest the same time and money in finding winning Facebook Ads strategies. Now, I’d like to briefly highlight some of my major takeaways. Of course, I can’t go into too much detail (you’ll want to buy the guide to learn the secrets), but I will definitely give you a flavor of what impacted me the most. First and foremost, I learned tremendously from Jonathan’s ad copy suggestions and tactics. He breaks down Facebook Ads into two components, image and text, and goes into micro detail on how you can optimize both. I was really enlightened by Jonathan’s tactical tips and walked away with some great strategies. These strategies are definitely out of the box! Second, I’m a big fan of bidding strategy. There are two major bidding models on Facebook: CPM and CPC. Jonathan goes into the nuts and bolts of both and exposes winning strategies. I was surprised to find that some of his strategies conflict with my own best practices from Google AdWords! Third, I really benefited from Jonathan’s discussion of Facebook Ads budgets and Upper Hand Techniques. This is where Jonathan really exposes some clever ideas that will take your campaigns to the next level. These are all out of the box strategies that took Jonathan substantial time and money to discover. As some constructive feedback, I will say that the first part of the guide was a bit too basic for me. The first section discusses the basics of affiliate marketing and how to apply for affiliate networks. I’m a pro when it comes to online marketing so I was able to skip this section. At the same time, I’ll definitely say there was more than enough new stuff in this guide (most of the guide, in fact) to empower my Facebook advertising game! Moreover, I think this first section is great for those that are new to affiliate marketing. To close out, I really want to highlight the fact that we’re in a dynamic industry. PPC Ian is all about educating and empowering online marketing professionals. Many of you guys are in the corporate world of SEM. I’m here to say that corporate success is all about keeping your winning edge and bringing that next big idea to your company. In my opinion, Facebook Ads are the next big thing. Facebook hasn’t blown up just yet (in the corporate world), so now’s your chance to stay ahead of the curve. Jonathan’s guide is a small $79 investment (limited time offer) that could fuel substantial gains in your online marketing career. If you’re an affiliate marketer, you’re going to make a ton more money. If you’re in the corporate world, you’re going to bring to the company strategies that will get you promoted! PS – You may be wondering, why would Jonathan give this all away for only $79 (limited time offer)? If he has such great strategies, why wouldn’t he keep them secret? My answer is simple: Jonathan wants to help people (just like my own philosophy)! Moreover, selling eBooks is a great way to diversify. Jonathan originally focused on Facebook to diversify his Google AdWords revenue streams. Now, he’s diversifying even more by selling an eBook. Not a bad strategy in my opinion. It’s a strategy that I respect very much and one that I envision myself taking in the future! 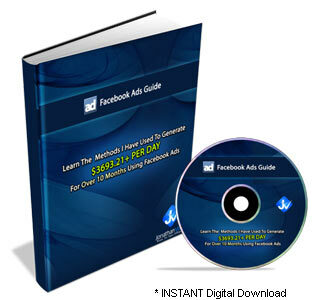 PPS – The guide comes with a bunch of amazing extras as well that will help you set up your Facebook Ads campaigns! Thanks for the great review Ian! 🙂 I really appreciate it and am glad you both learned something and I was able to change your perspective on the effectiveness of Facebook Ads! Thanks Jonathan for the comment! I’m definitely fired up about Facebook Ads right now and ready to make some $. Facebook ads are a lucrative media channel if attacked properly. Proof in the pudding: At Marin Software we re-prioritized our product road map for 2010, putting Facebook integration (among another things) at the forefront of our deployment scheduled based on repeat customer requests. Priorities are shaped by dollars, so if people are demanding Facebook at the top of their wish list, you know there’s ROI to be had. To the point of this post, it’s all about knowing how to monetize, and not treating Facebook like a typical paid search campaign. I look forward to reading the book, thanks for the tip Ian. Thanks so much for the comment Robby! Very helpful to know that Facebook is at the top of Marin’s queue. That certainly speaks volumes about the opportunity here. It’s hard to find a company in this space that has more vision than Marin. Awesome stuff! Why not write a real book (print) just like any other people in business world do? Why write sneaky and secret ebook? That no one can browse before buying. Of course, I know I will buy it and refund it because it may not be a secret after all. First, I want to say that I don’t think it’s sneaky to write an eBook. Are there eBooks out there that have poor content? Yes. Are there traditional print books out there that are just as bad? You bet! Just as with traditional print books, there are good and bad eBooks. My personal opinion on Jonathan’s is that it’s top notch. I certainly learned from it! Otherwise, I would have not included it on my blog. I take these things seriously and only share products with PPC Ian readers that I believe in myself. You bring up a good point about refunds. Jonathan’s book comes with a money-back guarantee. Why not give it a test drive? If you don’t like it, it’s within your right to return it for a full refund. Now, my opinion on this matter is that Jonathan has to go above and beyond to deliver value. The fact that the eBook has a refund policy enforces quality and that quality is very apparent! I bet if you purchase Jonathan’s eBook you may change your mind about returning it. Now, in terms of print books, I do have one closing thought: I’m a big fan. You may have noticed that I recently reviewed John Chow’s Book. I must say I’m a big fan of traditional print books because of the prestige of it all (I’m big on money and fame). John Chow can now say he’s a published author and that his book sells on Amazon.com and at bookstores. That’s pretty cool! At the same time, I do believe the margins are lower on traditional books (the publisher takes part of John’s sales). Moreover, traditional print books in our space can become outdated quite fast, especially taking into consideration how long it takes to publish one of these things. eBooks on the other hand are extremely timely. In sum, I think there are pros and cons of both. However, I really do want to underscore that there’s nothing sneaky about Jonathan Volk’s eBook. Thanks again DotcomNote and I’m looking forward to chatting with you more! Great review! And nice misleading title 😉 you were sly enough to address it on your post by stating you’ve changed your view. Very creative. Thanks d3so! As always, I appreciate the comment. I thought I’d try a creative title on this one to draw in more traffic and interest. I very much enjoyed reading your review as well. Everyone, you can check out d3so’s review here. Good review. I keep hearing good things about this guide. Thought about purchasing it a couple of times. Thanks so much for visiting my blog and for your multitude of comments today! I very much appreciate it. 🙂 Jonathan’s guide really is great and I highly recommend it. If you decide to buy, I kindly request that you purchase through one of my links. This is the main way I’m able to pay the bills over here at PPC Ian, making PPC Ian an amazing resource for the online marketing community. Thanks again! Hi Ian, I really hate Facebook because it’s hard to build Facebook campaigns and if i build one successful campaign by targeting right demographics, Facebook decline it. Thanks for visiting my blog and for the comment! I feel your pain! FB has given me challenges as well for sure. However, I highly recommend checking out Jonathan Volk’s Facebook Ads Guide. He discusses this very issue and gives some tips for editorial success. Best of luck to you (and me too!) in getting our Facebook campaigns to work! a) Had my ads declined – The title and copy were perfectly within FB’s standards, however I think they are starting to frown upon affiliate links and links to CPA offers (like email/zip submits). I couldn’t get one of these ads accepted for the life of me. b) Had my ads accepted, had a decent click-through rate, but didn’t have any conversions with the CPA offers. Perhaps my offer picks weren’t great, but they were definitely within the verticals that Volk recommended. I’m not sure what the reason is for my lack of success so far (perhaps just a lack of patience), but I’m hoping things turn around before I give up on Facebook advertising. I fear that Jonathan Volk made the bulk of his FB earnings before FB became strict about the ads it approves, and now that his book is out, the methods aren’t as successful as they once were. It’s a dynamic world for sure with PPC advertising (with respect to affiliate promotions and CPA offers), so I guess we all need to adapt to changing circumstances. Very insightful comment and much appreciated! First, I absolutely commend you for your efforts. If you keep going, I’m certain you will find success with Facebook Ads. Second, my own take is that you’re perfectly correct. It’s a very dynamic market and you’ll need to find your edge against the competition. Once you find your own trick and leverage the heck out of it, however, you will definitely find success! From my experience, the trick doesn’t have to be that crazy. It might be as simple and finding a really unique offer that nobody else is promoting and then focus on that one. Or, it might even be leveraging your deep vertical experience in accounting to promote an offer nobody else understands (or even create your own). This strategy of promoting less competitive products has worked well for me in the world of SEO. I’m with you, however, that Facebook is not easy! I’m still learning for sure and have a long way to go! But, that’s the fun part too. Thanks again, Eric, awesome comment! I’m finding Facebook advertising to be much more in depth now. Before it was a matter of find a decent offer, target a broad demographic and make money. Now you need to really drill-down to make any significant profit (at least in my experiences recently). Thanks so much for the comment. Very much appreciate your thoughts and personal experience advertising on Facebook. Personally, Facebook does nothing for me. I prefer not to use adverts, as I only blog, so advertising is not particularly helpful. Anyway, even if I did blog, I would avoid Facebook Adverts!